When Roo first started to read, she would bring home all manner of books home from school One day it would be a storybook, the next would be a fact-filled book about Egyptians. As she has grown in confidence with her reading I noticed that the selection of reading books started to change. Instead of picking up the first one that was in the reading box. She would study the book, flick through it and read the back cover to see whether this was a book that would interest her. Suddenly she had gone from the girl who would read everything to the one who would only read something of interest. This isn’t necessarily a bad thing but with so many different books available I didn’t want her to pigeonhole her reading selection – as books have a habit of surprising us. Something that was picked up on Roo’s reading report from school last year was that she tended to select the same style of books. So this year I have been on a mission to try to extend her bookshelves from the classic ‘girly’ books that she purchases with her pocket-money. The Dragon’s Green: Worldquake book one was recently sent across to us and after reading the back of the book I have to admit that I was quite keen to read it too. If you had secret magical powers, how would you know? After the Worldquake, Effie knows about magic – time spent in her grandfather’s library made sure of that. But there’s much she still has to learn. About the Otherworld. And about the Diberi, a secret organisation which plans to destroy the entire universe. Effie and her school-friends are the only ones who can stop them… and time is running out. Although not Roo’s usual genre of book, the magic aspect of the storyline gripped her. The book is pack full of magic and adventure and proved to be a real page-turner for Roo. 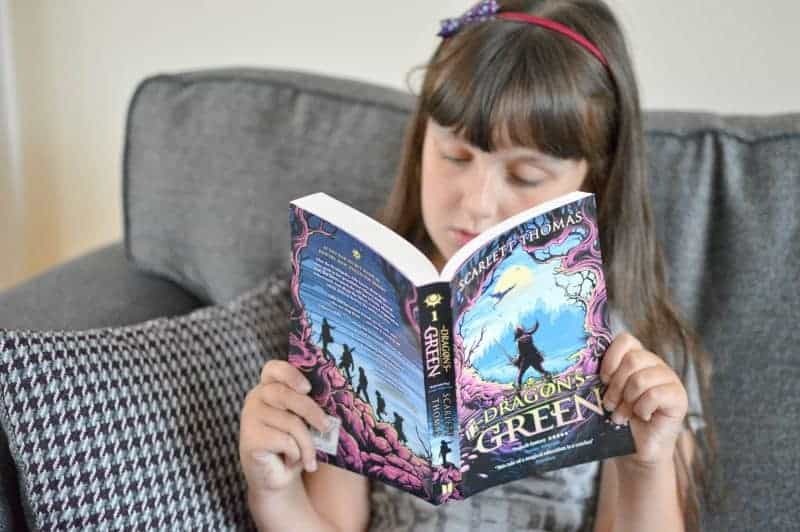 The fantasy novel is along similar lines to the Percy Jackson series (which Roo has watched the films but not read the books). Lemony Snicket’s A Series of Unfortunate Events and J.K. Rowling’s Harry Potter. The first book in the Worldquake series, with planned, follow-up books The Chosen One (April 2018) and The Keepers (April 2019). Scarlett Thomas has always loved stories, magic and mysterious places. She tried (and failed) to write her first novel when she was six. Since then she has successfully written lots of novels, but this is her first one for children. She lives near the sea in an old house full of books and is a professor in the English department of the University of Kent. Dragon’s Green: Worldquake Book One // Where Can I Buy? The Dragon’s Green: Worldquake Book One is available to buy from Amazon and all other good book retailers. Boo Roo and Tigger Too are pleased to say that we have an additional copy of Dragon’s Green: Worldquake Book One to giveaway to one lucky reader.